When I joined Mturk, I didn’t know from where I should start so I stopped working on this amazing site. After almost 6 months, I again joined this site and tried to learn the way of working. Now after 6 months working on Mturk, I can say it is very easy to work here. i have earned almost $1000 on this site by doing tasks which I like to do.If you have joined Mturk and confused about how to work on this site then don’t worry, I am here with all details, just go through below steps and start earning now. Step 1 : How to join MTurk? Click Sign in as a “worker” and then check “I am new user”, enter your email address, password you want and sign in. Once you signup for MTurk, your account will be reviewed by Amazon team and once approved/rejected you will get mail from Amazon. Step 2: How to find MTurk Hit? Find hit to start working on hit. Step 3: How to accept MTurk Hit? Once you have found hit to work, click “view a hit in this group” and accept hit before you start working on hit. Once you clicked “view a hit in this group”, click Accept Hit and start working on hit. Step 4: How to work on MTurk Hit? 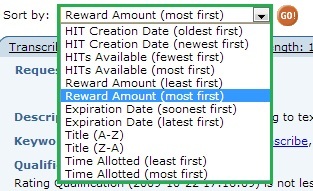 Once you complete hit, don’t forget to submit hit also you should submit hit before time expires. Many of Amazon hits will require you to submit hit with completion code which you will get from external site where you completed task/survey. Just make sure that you have entered correct code or your hit will be rejected. Once, your hit is approved by requester, your account will be credited. Step 5: How to withdraw money at Mturk? You can withdraw your money as soon as you have $25 in your account. Currently mturk is not paying through Paypal. Amazon sends Paycheck so make sure that you have given correct address and name. there is $4 processing fees for every cheque. Now you know that how to work on MTurk, so lets get started.